Thanks to Jane Cronin for this wonderful document! from my daughter and am forwarding it to you in the event you may not have seen this before. if the spelling is off. Any thoughts? Would Peter have collected his pay in Quebec City and thus met Elizabeth Jefferies there? the best sources have been British documents. What a terrific document. It was a great Christmas present for you and your family! Is it OK with you if I add your e-mail and a copy of this document to our web page on Peter Cavanagh and Elizabeth Jefferies? Please let me know. I’ll also add your e-mail to the list of Peter Cavanagh researchers at the bottom of the page. and a member of the Ottawa Branch of the Ontario Genealogical Society. He will be able to answer your questions. Hi Jim. Thanks again for this – it’s a good start to the new year. is. Thank you for the work you and all you contributors have done. 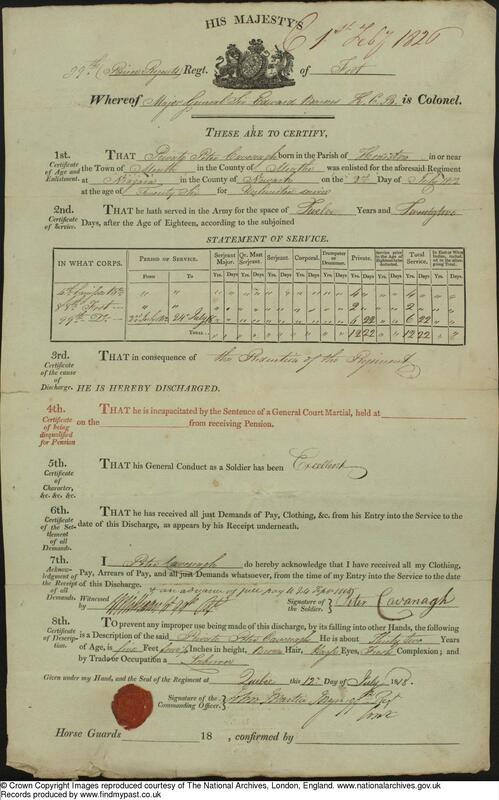 various census and both St. Phillip's and St. Clare's church records. What I have found though is that there is a large gap in the records. Do you know of any records for this 15 year gap? Where did RC's in the area get married before 1837? Are there records from this location? and from other churches, some of whom may be related to the original Peter Cavanagh. Elizabeth Jeffries as we had wrongly assigned a different wife to Peter Kavanagh. refer me to anyone else researching these lines as well, I would appreciate it. churches. Family history had previously listed his wife as Ann Powers. and Elizabeth Jeffers on 24 August, 1837. Richmond or Fallowfield or ??? possible some of her family migrated here with the Mears and Devines. was born in County Meath, Ireland. He joined the 99th Regiment of foot in 1812 at age 26. I was searching internet for my great-grandfather, Peter Cavanagh and I came upon all the research you'd found. (1919) to the best of my knowledge. I do know about St. Philip's. 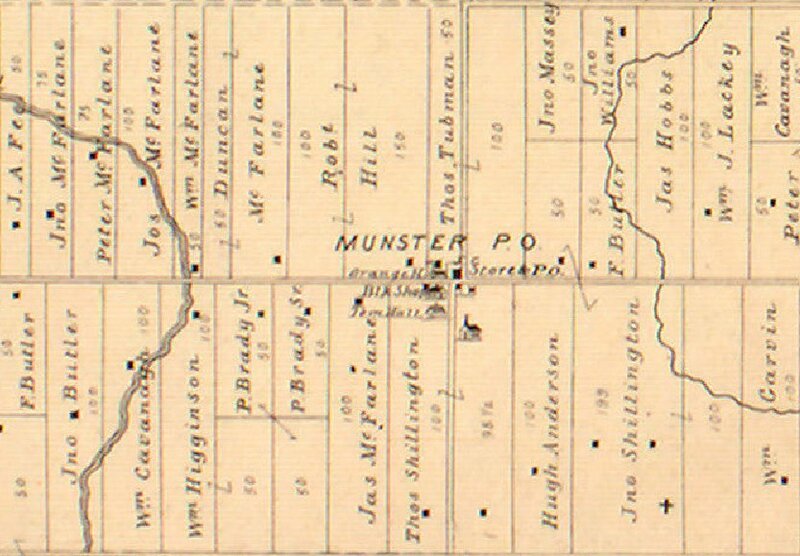 My ancestors had a farm in Munster, not far from Richmond. (See location of Peter Cavanagh's farm on the 1879 map below). The Jock River is shown on the western side of the village. Peter Cavanagh's farm is in the north-east corner of the map. to your Peter Cavanagh from Meath? If so, you would be filling in a tremendous gap for me. I'm lost at this person, my great-grandfather. Any thoughts? I can check for you. in St. Clare's also. 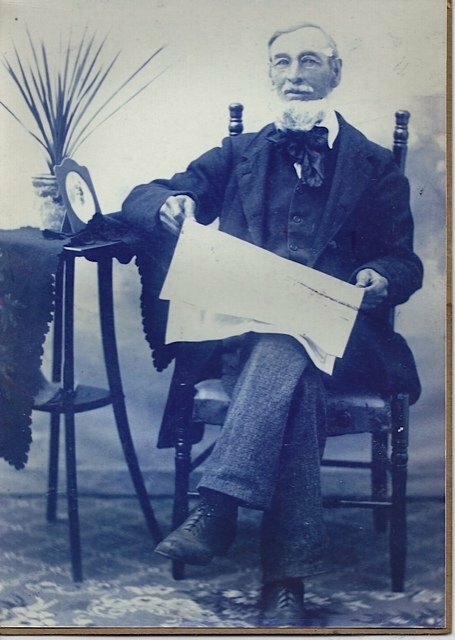 Below is a photo of Walter Cavanagh, taken in Carleton Place in 1865.
this one. As far as the Regiment Peter was from, do you know anything about that type of thing, especially relative to him? For fighting, I assume he got the land? Where did he fight? grandfather. What a small world! What a coincidence that I was just fiddling around on the computer today. Concession 6, Lot 13 East. Marriage of Peter Cavanagh to Elizabeth Jefferys. Witnesses: Hugh Brunnuck and Elizabeth Brunnock / Brannack? Married by me, the undersigned priest of Montreal, Walter Cavanagh to Mary Larkin. The witnesses were Bernard Larkin & Ann Cavanagh, all of Goulbourn. Baptism of Peter, born 19 October, same year, legitimate son of Walter Cavanagh and of Mary Larkin. The sponsors were Patrick Larkin and Bridget Cavanagh. and Joanna Kells, both of Goulbourn. The witnesses were William Dwyer and Elizabeth Cavanagh. Baptism of Peter, born 2 November last. Name of parents: William Cavanagh and Catharine Kells. The sponsors were James Maguire and Bridget Cavanagh. Baptism of James, born 8th inst. of the lawful marriage of William Cavanagh and Catherine Kells. The sponsors were Patrick Brady and Mary Kelly. Baptism of Elizabeth, born 20 June last of the lawful marriage of William Cavanagh and Catharine Kells. The sponsors were Patrick Dwyer and Elizabeth Brady. Baptism of Mary, born 21 July last of the lawful marriage of Walter Cavanagh and Mary Larkin. The sponsors were Peter Cavanagh and Margaret Myers / Mears? and Margaret Hemphill, also of this parish, daughter of age of John Himpill (Empy ?) and Ann Evoy (deceased). Present; James Fitzgerald, Elizabeth Cavanagh who cannot sign their names. Baptism of Walter, born 17 March last of the lawful marriage of Peter Cavanagh, farmer, and Margaret Empey / Hemphill. The sponsors were John Grant and Catharine Cavanagh (alias Kells). Walter was born on St. Patrick's Day, 1861! Baptism of Joanna, born 15 June last of the lawful marriage of William Cavanagh and Catharine Kells. The sponsors were James Mulligan and Elizabeth Cavanagh. Baptism of William, born 24 June last of the lawful marriage of William Cavanagh and Catharine Kells. The sponsors were Peter and Margaret Cavanagh. Baptism of Joseph, born 26 May last of the lawful marriage of William Cavanagh and Catharine Kells. The sponsors were Timothy Kelleher and Catharine Kelleher. Baptism of Walter, born 13 October last of the lawful marriage of William Cavanagh and Catharine Kelsey. The sponsors were Peter Cavanagh and Elizabeth Brunnagh. Baptism of Patrick John, born 3 inst. of the lawful marriage of William Cavanagh and Catharine Kells. The sponsors were Edward Myers / Mears? and Catharine McDonnell. Baptism of Alfred Michael, born 20 June last of the lawful marriage of William Cavanagh and Catharine Kells. Walter and Peter Cavanagh, Patrick Brady and many others. and Ann McCarthy, daughter of age of Daniel McCarthy and Margaret Dooley of Nepean. Witnesses: John Larkin and Ellen McCarthy. Baptism of Joseph Sylvester, born 13 April 1892 of the lawful marriage of Peter Cavanagh, farmer, and Ann McCarthy. The sponsors were Michael Larkin and Mary Ann Cavanagh. Also shown here is a 14 year old son, Dan, notated as being a "farmer's son" (oldest son expected to inherit his father's farm). "Peter F." in the family is listed as "Frank" in the next (1911) Census. and here is Sylvester, son of Peter Cavanagh (with a "K") and Ann McCarthy in the 1911 Census, aged 19, born April 1892 (church record, above). Daniel, now aged 24, is listed as a Single Man, Head of Family. Sylvester is now 19 and is enumerated just as Sylvester, not Joseph Sylvester. 10 January Burial of William Cavanagh, aged 79 yrs., (born in 1826), who died the 8th inst., widower of Catherine Kelsey. Present: James Cavanagh and Peter Cavanagh. 20 January Burial of Walter Cavanagh, aged 81 yrs., (born in 1824), who died 18 January, widower of Mary Larkin. Present: John Larkin and William Cavanagh. formed the nucleus of civilization at the time in this area. There are thousands of their descendants in the Ottawa area, today. in Goulbourn Township (the Richmond area). When going through the St. Philip’s records this morning, I noticed that there were a lot of Timmins names included there, starting about 1837. 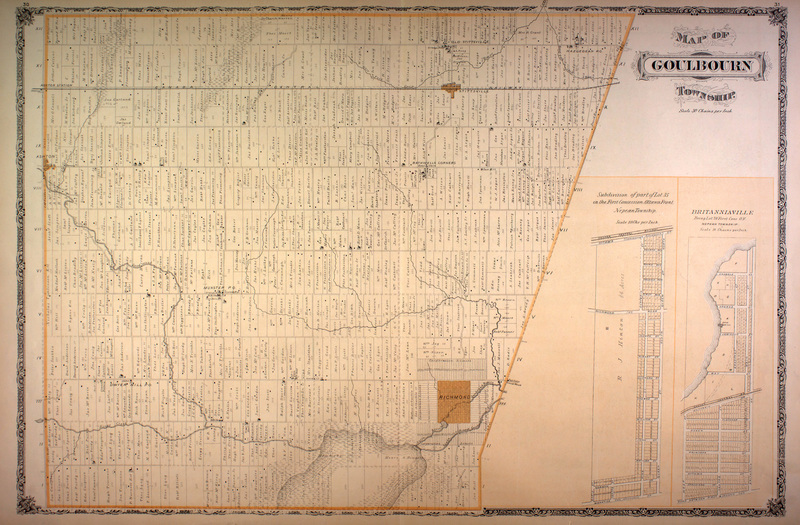 Was your grandmother’s family also in the Ottawa area in the 1800’s? Timmins ancestors did get a Crown Land grant here. Let me know, and I’ll check into it. governor. Dad was Sylvester Cavanagh's son. Sylvester was the son of Peter Cavanagh and Ann McCarthy. and Peters in there to get them straight. document should be made available as a .pdf file? (now 90 yrs)., I can answer some questions. repository where future generations will be able to learn about our family histories. A .pdf file will be fine. Just send it along as an e-mail attachment. which is searchable at http://ogsottawa.on.ca/home/library/ .